Thousands of years of Chinese tradition testify to the effectiveness of feng shui – arranging objects in a certain way to achieve balance and attract positive energy. Even if you don't practice this for the more mystical interpretation, there is still an opportunity for finding peace and harmony by adding a little desk feng shui. Creating desk feng shui in your work space is a pleasing way to help boost your productivity. 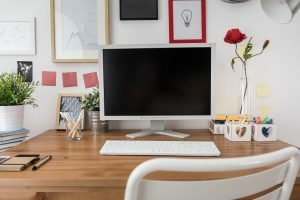 Everyday office décor, comfort, and lighting can leave a little bit to be desired, taking control of the organization of your desk can make it feel a little more like home, and open you up to achieving more and staying focused every day. Abundance and Prosperity (Purple) – This top-left space should be used to target money and abundance. You can use a classy vase or sculpture, or take it a more literal route and place your fancy laptop in this corner. Fame and Reputation (Red) – The upper-middle portion, this area is often the perfect home for an embossed nameplate. 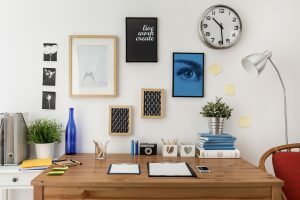 Since it is the head of your desk, a nameplate is a logical choice, but you can also keep your business cards here or frame a photo of one of your accomplishments. Love and Relationships (Pink) – Ah, love. In the top-right of your desk place an item that stirs your emotions. It can be something living, like a small potted plant. A picture of your spouse or loved ones will also do the trick. Maybe you have a favorite toy from childhood? Put it here! Family and Community (Green) – If you haven’t noticed, some of these categories overlap. That’s okay! This middle-left section is also great for a family photo, but could perhaps be filled with a token of gratitude from your employees, like an award (hopefully your very own Dundie). Mind, Body, and Spirit (Orange) – This is the middle of your desk, and as such it’s best to keep it empty and free of clutter so you can properly focus on your work. Attract good energy to your desk by freeing up space to attend to your daily tasks. Creativity and Children (Yellow) – This middle-right section of your desk is the perfect place to fuel your creativity and provide inspiration. If you’re a writer a journal is a great idea, and for artists a sketchpad is a necessity. Otherwise, think outside the box and provide yourself with some brain fuel! Wisdom and Self-Awareness (Teal) – This bottom-left area is typically reserved for the pursuit of new knowledge. Maybe keep an idea book, or one of those word-a-day calendars to expand your vocabulary. Often, this section blends into others (remember, no need to fill every space). 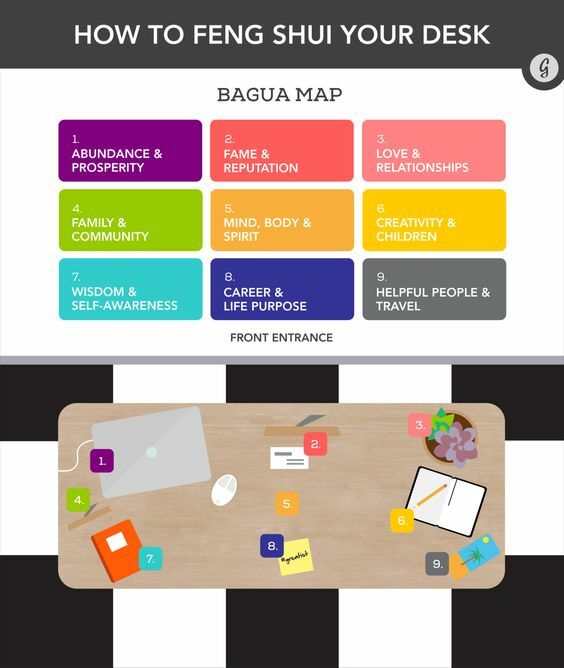 Career and Life Purpose (Blue) – The bottom-center section is all about your career. Again, it’s best to keep this space free – who wants to continually reach over clutter? But maybe you can tape some inspirational quotes or meaningful instructions here for quick reference. Helpful People and Travel (Gray) – For your friends and faraway places. This bottom-right area is great for a phone, for literal reasons, but if you don’t have an office phone you can substitute a dream-vacation photo or a mini-globe if you like. Incorporating a little desk feng shui can bring you more energy and focus throughout the day. For added focus, use a Wurf board to engage your body in micro movements so your core muscle groups can relax and your mind can settle. Do everything in your power to promote positive energy at your desk so you accomplish your goals day in and day out.